Google has released the latest Android 6.0 update, nicknamed Marshmallow. Preloaded on the new Nexus 5X and Nexus 6P devices, the update is also being rolled out to older Nexus devices. However, be prepared to wait if you have an Android phone from other vendors. HTC was the only manufacturer that could tell us when its devices (from the Desire 816 to the flagship One M9) would get the update, which would be the first quarter of next year. A new look called Material Design was introduced in Android 5.0. Marshmallow keeps this design language, but with some interface tweaks. In Android 5.0 and older, you could only uninstall an app from the app drawer. It annoyed me that you could not do so directly from the home screen. Android 6.0 rectifies this. It is also easier than before to access your frequently-used apps. When you click the app drawer button, the top row shows the apps you have opened recently. The rest of your apps are then arranged alphabetically. App permissions have been tweaked. Instead of giving apps blanket permission to use all the features on your phone during installation, permission pop-ups appear only when the app requests the use of a specific part, such as the camera or the microphone. When it works, Google Now on Tap feels like magic. It picks up key words, from restaurant names to movies to celebrities, and gives useful information... Instead of switching between apps, such as opening a browser to check out a restaurant, you can do everything via Google Now. When you click on the camera function in an app for the first time, you will see the pop-up. This behaviour lets you understand why the app is making such a request now. Android 6.0 has a new battery- saving mode that kicks in when the phone is stationary, such as when it is on a table. Called Doze, this feature puts apps to sleep to prevent them from accessing the network and draining the battery. Users can exclude an app from being put to sleep in the battery settings. During its test, my Nexus 5 smartphone battery showed a dip of just 5 per cent when the phone was left overnight, which is remarkable. I cannot remember how my phone's battery life fared on Android 5.0 in this scenario, but it was definitely a lot worse. The Google Now screen looks cleaner. You still access this personal assistant by swiping left from the home screen but it can be activated from within any app with a feature called Google Now on Tap. Press and hold the Home button and a Google Now card will surface. Depending on the context of the app and screen, it will show cards that Google thinks are relevant. For instance, I got an SMS from the National Library telling me my loans are due soon. Google Now on Tap gives me a card for the National Library with options to call it, access its website or even peek into the interior of the library using Google Maps. I can follow up with a related question using Google's voice search. I can even afford to be less than specific, such as asking: "Where is it?" 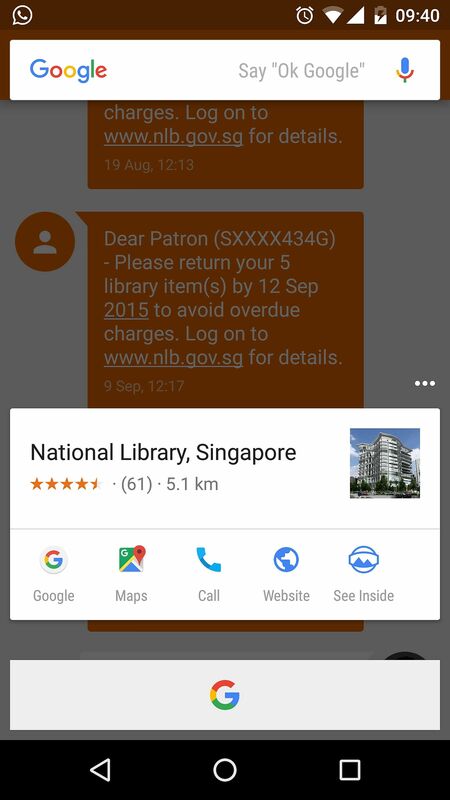 Because Google knows the context, it tells me the address of the National Library. When it works, Google Now on Tap feels like magic. It picks up key words, from restaurant names to movies to celebrities, and gives useful information. It even offers to schedule appointments, given the right context. In other words, instead of switching between apps, such as opening a browser to check out a restaurant, you can do everything via Google Now. But there are moments when the illusion falters, like when Google offered to create a lunch appointment at NTUC, and you realise that it is not that intelligent. Not yet.